Hobart vs Launceston. Cascade vs Boags. Mount Wellington vs Cradle Mountain. Gagebrook bogans vs Ravenswood bogans. Tasmania is often spoken about by locals as being a very parochial state. We have the North/South divide, with each half of the state engaged in a long running battle about who has the best stuff. In the new game of Tasmanian whisky, the cards are very much stacked on the side of the South, with eight of the nine distilleries in the state residing there. However, the North cannot be swept off the board that easily, as it has a very impressive golden ace up its sleeve. Hellyers Road, located in the North-West city of Burnie, has officially launched its 12 Year Old whisky, making it the first distillery in Australia to release an expression of this age. In 2012 the company released a 10 Year Old single malt which showed promise of greatness, and now two years later that potential is being realised. Pleasingly the extra years spent sleeping in oak have helped smooth out the edges without compromising the creamy, buttery flavours unique to Hellyers Road. Compared to the white wine colour palate of the Hellyers Road Original, the longer time in the barrels has imparted a rich golden hue to the 12. The nose opens with vanilla from the American bourbon oak, followed by the creamy nuttiness of macadamias, cashews and almonds. There are also elements of candied citrus peel and melted butter to be found. The overall effect is of vanilla cupcakes coated in orange and poppy seed icing. On the palate the 12 is smoother and yet more complex than other Hellyers Road expressions, with delicate honeyed undertones that are reminiscent of the lightly burnt sugar on top of a crème brulee. Complementing the sweetness are subtle herbal notes and spice that bring to mind the leaves of the Tasmanian native pepper berry bush. The finish is light and imparts a soft warmth to the back of the throat. When we asked Hellyers Road head distiller Mark Littler if the 12 was everything he intended it to be, his simple reply was that “it’s more”. Two years may not seem a long time to us, but to this whisky that short period is incredibly significant and adds a high class edge of silk into the mix. The 12 year old is the defining expression of Hellyers Road, and an exciting move forward for Tasmanian whisky. As Northern boys we’re proud to say that the golden ace has been played with style in our end of the state, and taken the game to a whole new level. Wow, sounds like an excellent whisky! I know absolutely nothing about Australian whisky – and I’m not sure I be ever even seen one here in Canada. As a single malt, I’m guessing that barley is the main grain used, but do other grains make an appearance in any of your whiskies? I’m interested because Canadian whiskies often use corn, wheat, and especially rye. Also, what abv would a 12 year old like this one be bottled at? It’s a great one – keep an eye out for it! I’m confident it will be unlike any other whisky you’ve tried! Mostly all Tasmanian whiskies use barley, but there is one, called Belgrove which is 100% rye! The percentage varies, but it is often 46% ABV (which is the magic, non-chill filtered kind of percentage). I’m glad you liked the review! Aha! Excellent! 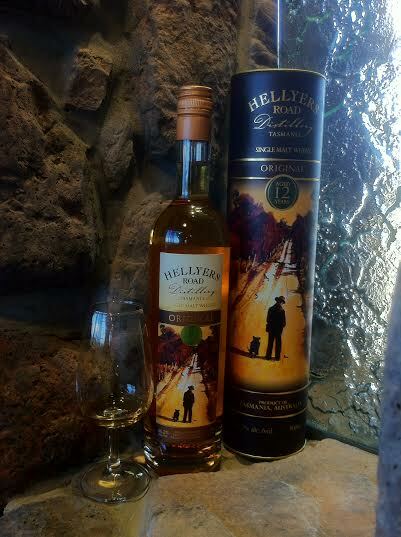 Have you ever tried any other Hellyers Road expressions? I certainly appreciated the 12 Year Old better when I had a bit of context from younger expressions. Anyway, I look forward to hearing your thoughts.